• 1 cup fresh raw milk cheese, crumbled (approximately 4 ½ ounces) – also known as Farmstead cheese available at farmers markets. An alternative would be a high quality cheese, ideally from grassfed cows. Preheat oven to 325 degrees F. Wipe 8x8x2 inch baking dish with oil or butter to grease. Bring a large pot of salted water to boil. Add rainbow chard and cook until wilted, about 2 minutes. Drain, squeeze dry and add chopped garlic. Cover and let sit. Heat oil in large nonstick skillet over medium-high heat. Add onions to skillet and sauté until slightly browned, about 2 minutes. Add bacon and sauté until desired crispness; keep separated with a fork. Remove from heat and cool. Whisk eggs, cream, salt and pepper in large bowl to blend. Add chard and cooled bacon-onion mixture, then add cheese; stir to blend using wooden spoon or fork. Transfer mixture to prepared baking dish. Bake frittata in preheated oven until the center is set, about 45-55 minutes. Transfer baking dish to rack and cool frittata 15-20 minutes. 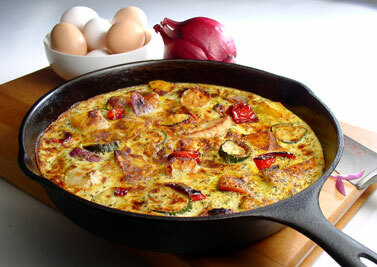 To transfer the frittata from the baking dish to a serving dish, place a platter on top of baking dish, using oven mitts, hold the baking dish and platter firmly together and invert frittata onto platter, place serving platter atop frittata and invert again so that frittata is right side up. Cut frittata into 20 pieces. *This dish can be made up to 1 day ahead and chilled in the refrigerator, and re-warmed at 325 degrees F until completely heated through, about 10 minutes. Garnish with fresh parsley and enjoy warm or at room temperature.